The goal of our children’s ministry is to assist parents in teaching their children the truth – about who God is, who they are, and what God expects of them. This truth can only be found in the Scriptures. Sunday School Classes – Learning happens differently at different stages of development. For this reason, we have separate Sunday School classes for children 3 yrs – Kindergarten, 1st – 3rd grades, and 4th – 6th grades. Utilizing the curriculum from Generations of Grace, all classes focus on the same story on any given week, but all do so at age-appropriate levels. 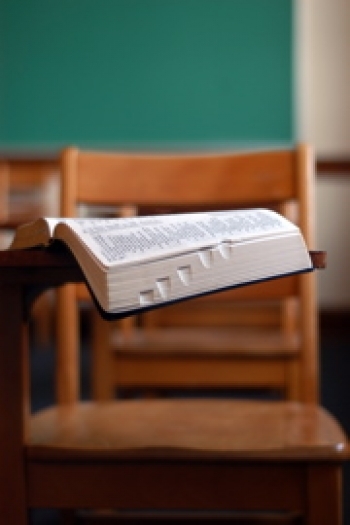 This curriculum is structured to acquaint the student with the Bible chronologically. Jr. Church – Sitting through “big church” can be a bit daunting – for children and parents alike! To help parents focus in their worship, we provide a Jr. church program every-other week for children 3 years old through the 1st grade, employing the Christological approach of The Gospel Project curriculum. To help parents teach their children the important skills of sitting through “big church,” we only offer this program every-other week. Wednesday Evening Bible Program – Many Bible-memorization programs prove to be rigorous yet largely unproductive because of a tendency to cram verses into children’s heads without focusing on comprehension, and even less on retention. Truth Trackers is the program we utilize to acquaint our students with the Bible systematically. The program features weekly Scripture memory (one new verse and two review verses per week – for a total of three), daily devotions, and a three-year rotation of biblical doctrines.